The full moon will turn red for half of the world when Wednesday’s lunar eclipse occurs, but some Americans and Asians could be treated to an extra helping of astronomical weirdness — the sight of an eclipsed moon sharing the sky with the sun. Just seeing a lunar eclipse is a treat: This is the second in a “tetrad” series of four such events, spread over the course of 18 months. The first in the series took place in April; this time, the best seats in the house are in western North America, east Asia, Australia and the Pacific. Technically, the show gets under way at 4:15 a.m. ET Wednesday when the edge of the moon just starts to dip into the lightest zone of Earth’s shadow, known as the penumbra. But the viewing doesn’t get good until at least an hour later, when the darker part of the shadow (the umbra) begins to creep across the moon’s disk. The climax comes between 6:25 and 7:25 a.m. ET, during the eclipse’s total phase. That’s when the sun, moon and Earth are positioned so that our planet blocks nearly all the sunlight heading in the moon’s direction. The term “nearly” is key: Earth’s atmosphere should refract the sun’s rays just enough to throw a reddish, sunset-like glow onto the moon’s darkened disc. The precise shade depends on atmospheric conditions: Sometimes it’s so ruddy that skywatchers call it a “blood moon” — which is apt for Halloween season. Skywatchers in the eastern United States (and other regions of the world, including a slice of Asia, Australia and the Pacific) could get in on the strange sun-plus-moon sight. When you consider that the sun and the moon are on precisely opposite sides of our planet during a lunar eclipse, it may seem geometrically impossible for an earthly observer to see both celestial bodies at the same time. However, the refraction effect means light can be bent enough to place the sun on one side of the sky, and the darkened moon on the other. This effect is known as selenelion — pronounced “sell-a-NELL-ion,” to rhyme with “hellion” (though “sell-a-NEEL-ion” may be an alternate). To see it, you have to be at just the right place at the right time. For Americans, that’s when the moon is setting and the sun is rising. This map shows where Wednesday’s lunar eclipse will (and won’t) be vlsible. The transition zones are where it’s theoretically possible to see the eclipsed moon and the sun at the same time. Farther inland, Midwesterners could see the rising sun and the partially eclipsed moon together in the sky. This map from Sky & Telescope gives you an idea what you can see where, and the U.S. Naval Observatory can fill you in on the times for moonset and sunrise in your locale. If you’re in one of the eclipse transition zones, and if sunrise precedes moonset, there’s a chance of seeing selenelion. If you miss out, don’t despair. Even Zeiler couldn’t quite catch the climactic moment when he watched a lunar eclipse from Los Alamos, N.M., in 2011. 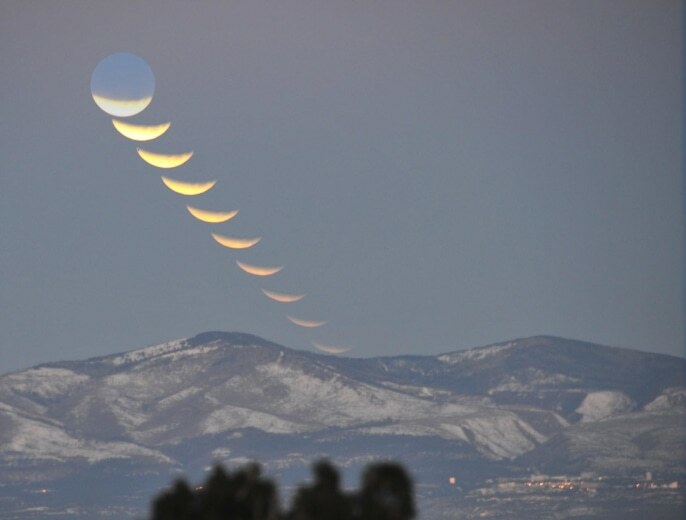 Michael Zeiler’s multiple-exposure image shows the lunar eclipse of Dec. 10, 2011, just as it was nearing its total phase. At the same time that the moon was setting in Los Alamos, N.M., the sun was just about to rise. NASA will offer a live Ustream video feed of the eclipse, plus a Web chatwith moon experts. The chat begins at 3 a.m. ET and continues until sunrise. NASA also says it’s planning a Reddit “Ask Me Anything” event as a warmup for the eclipse at 4 p.m. ET Tuesday. The Coca-Cola Space Science Center at Columbus State University in Georgia has scheduled a skywatching webcast that begins at 3:30 a.m. ET. The Slooh virtual observatory will feature live feeds from Australia and North America during a webcast that begins at 5 a.m. ET. EarthSky.org’s Deborah Byrd will be among Slooh’s guest commentators. The Virtual Telescope Project will share views from astrophotographers in Australia, New Zealand, Panama, Canada and the United States, starting at 6 a.m. ET. After the eclipse, you can bet that photographers will be posting pictures to SpaceWeather.com and other websites. Want to try it yourself? For detailed tips, check out Bob King’s guide to lunar eclipse photography at Universe Today. Missed it again, but I think it’s because we’re not high up enough here, though we are in New England. I have seen one, but it was years ago. It’s amazing! I would give anything to see this. What an amazing sight of the planets that I you don’t get to see be very day. Ya when did this happen. I remember this moon. I was on my way to work at 5am. I noticed the moon looked rock like.